In order to understand cerebral palsy (CP), it is a good idea to categorize CP by the effects it has on the child’s movement and motor skills. Cerebral palsy is a lifelong condition that causes a child to have problems with movement, posture, balance and coordination. CP is caused by an injury to the developing brain. This brain injury is often caused by birth injuries that cause a baby to develop hypoxic ischemic encephalopathy (HIE) and seizures. Hypoxic ischemic encephalopathy occurs when there is a lack of oxygen in the baby’s blood or a restriction of blood flow in the baby’s brain. Mismanaged conditions during delivery are a frequent cause of HIE. These include umbilical cord problems, brain bleeds/hemorrhages, placental abruption and uterine rupture. HIE typically occurs when these conditions deprive the baby’s brain of oxygen for too long because the physician fails to quickly deliver the baby by C-section when the conditions are present. Hypoxic ischemic encephalopathy is the most common cause of seizures in babies, and HIE frequently leads to a later diagnosis of cerebral palsy. Approximately 35% of children with cerebral palsy suffer from seizures. What Are The Classifications of Cerebral Palsy? One way to classify cerebral palsy is to break it down into two categories: spastic/pyramidal cerebral palsy and non-spastic/extrapyramidal CP. Spastic/pyramidal cerebral palsy. Spastic CP is the most common type of cerebral palsy, affecting 70-90% or all children who have CP. It is characterized by increased muscle contraction and rigidity that hinder a child’s voluntary movements. A child with spastic cerebral palsy has tight muscles in some parts of the body that are unable to relax. Joints that are affected become stiff and very hard to move. The child typically has problems controlling movements, poor coordination and balance, and difficulty talking and eating. Hemiplegia or diplegia: One arm and one leg on the same side of the body (hemiplegia) or both legs (diplegia/paraplegia) are affected. These are the most common types of spastic CP. Have problems sucking and swallowing. Have a weak or shrill cry. Have a very relaxed and floppy body or a very stiff body. When held, they may arch their backs and extend their arms and legs. Be irritable and jittery when awake. For example, they may startle easily. Sleep a lot or show little interest in what is going on around them. Triplegia: Either both arms and one leg or both legs and one arm are affected. Non-spastic/extrapyramidal cerebral palsy. Non-spastic CP occurs when there is an injury to the part of the brain that controls the involuntary motor system. This type of CP is characterized by involuntary movements that can be exaggerated when the child has voluntary movements. The nonspastic forms of cerebral palsy include dyskinetic cerebral palsy (athetoid and dystonic forms) and ataxic cerebral palsy. Dyskinetic cerebral palsy. Dyskinetic CP is associated with muscle tone that fluctuates between being loose and very tight. In some cases, rapid and jerky or uncontrolled slow, continuous movements occur involuntarily. These movements often affect the face, neck, hands, feet, arms, legs, and sometimes the torso. Athetoid (hyperkinetic) CP characteristics include relaxed and limp muscles during sleep, with some involuntary jerking (chorea) or writhing (athetosis). If the face and mouth muscles are affected, problems may develop related to unusual facial expressions, drooling, speaking, and choking when sucking, drinking, and eating. In newborn babies, high bilirubin levels in the blood, if left untreated, can lead to brain damage in the basal ganglia (kernicterus), which can lead to athetoid cerebral palsy. In cases of dystonic cerebral palsy, the body and neck are held in a stiff position. Ataxic cerebral palsy. Ataxia-type symptoms can be caused by damage to the cerebellum. Ataxic CP occurs in 10% of all cases, at most. Some of these children have hypotonia (loose muscles) and tremors. Motor skills such as writing, typing, or using scissors might be affected, as well as balance, especially while walking. It is common for these children to have difficulty with visual and/or auditory processing. What Are the Treatments for the Different Types of Cerebral Palsy? Selective dorsal rhizotomy (SDR) is one of the best treatments for spastic cerebral palsy. In SDR, nerves that lead to and from spastic muscles in the legs are carefully tested. The nerve branches that are abnormal are cut by the surgeon. The goal of SDR is to permanently relieve spasticity in the legs. Young children have a better ability to make the most of the reduction in spasticity, to increase leg strength and to learn new movements in order to increase function. Children undergoing SDR must do intense physical therapy after the surgery in order to obtain maximum benefits. Selective dorsal rhizotomy (SDR) is one of the newer treatments for spastic cerebral palsy, and many physicians have called it groundbreaking. Baclofen is very commonly used as an oral medication for the treatment of spasticity. After a dose is administered, the muscles begin to relax within two hours, reaching peak effectiveness approximately 2 or 3 hours later. Baclofen typically loses its effect after 8 hours. What a baclofen pump is used for treatment, physicians place a pump that is about the size of a hockey puck in the child’s abdomen. The pump continuously delivers the medicine into the fluid surrounding the child’s spine. Baclofen is a muscle relaxant that reduces spasticity throughout the body. Since the medicine goes directly into the nervous system, the dose of baclofen the child gets through the pump can be much lower than doses delivered through the mouth. This helps avoid the side effects of higher doses, which include sleepiness and sedation. Anti seizure medication is a typical treatment since seizures are very common in children who have cerebral palsy (any type). The treatment for seizures is based on the type and frequency of the seizures. Complete seizure control can often be achieved using a single medication, such as Phenobarbital, but some children with cerebral palsy have particularly difficult-to-control seizures. Medications can have side effects affecting the brain, ranging from sedation to hyperactivity. The drugs can also affect liver function and white and red blood cells, and it is not uncommon to have bone problems. Side effects are usually not harmful and resolve when the offending medication is discontinued. The goal of the physician should be for the child to become seizure free with few or no side effects. For children that have spastic cerebral palsy, treatment of the spasticity should include the use of medications and surgical procedures to decrease spasticity, facilitate movement, and prevent contractures. Among the most common medications used are dantrolene sodium and diazepam. Diazepam is both a muscle relaxant and a sedative. Baclofen can be taken by mouth or infused continuously with an implanted pump. The ketogenic diet is a precisely prescribed diet that is used to help control seizures in children who have seizures that are difficult to control. The diet is very high in fat and low in sugar and carbohydrates. All parts of the diet, including protein, must be measured. Calories and fluid are strictly controlled and all food and fluids have to be precisely weighed in order for the diet to work. Botox can be very beneficial for a child who has spastic cerebral palsy. Botox is a medication that can be injected directly into spastic muscles to reduce tightness in that particular muscle. The dose is varied depending on the muscle being treated and how severe the tightness is. Various muscles can be injected at once, although in young children this may require brief anesthetizing. Most kids notice improvement within a few days after the injections, with the results lasting for 2-4 months. Over time, the effectiveness of the Botox injections seems to decrease. Botox almost never causes any central nervous system side effects and the medication is known for its safety and complete reversibility. The drawback of Botox is that it only affects the muscle(s) into which it is directly injected. Children with severe, overall spasticity will not benefit, as the amount needed would be far more than the maximum limit. In such cases other methods are generally recommended. Physical therapy is aimed at promoting motor and developmental skills. The parent or caregiver should be taught the exercises or activities that are necessary to help the child reach her full potential and improve function. Daily range-of-motion (ROM) exercises are important to prevent or delay contractures that are caused by spasticity and to maintain the mobility of joints and soft tissues. Stretching exercises are performed to increase range of motion. Progressive resistance exercises should be taught in order to increase strength. The use of age-appropriate play and of adaptive toys and games based on the desired exercises are important in order to make the therapy fun and get the child’s full cooperation. Strengthening knee extensor muscles helps to improve crouching and stride length. Postural and motor control training is important and should follow the developmental sequence of normal children; head and neck control should be achieved, if possible, before advancing to lower body control. The use of Kinesio taping (elastic therapeutic tape) can help educate muscles for stretching and strengthening, and aquatic therapy can also be beneficial for strengthening, as can electrical stimulation. Vibration and short-term use of heat and cold over the child’s tendons may help to decrease spasticity. These treatments, however, only decrease spasticity briefly and should be used in conjunction with ROM and stretching exercises. Electrical stimulation of weakened muscles is usually tolerated well in older children and can help strengthen muscles and maintain muscle size. In a child with weak dorsiflexors (muscles in the lower leg that act on the foot) that are causing foot drop or tripping, for example, electrical stimulation to the anterior tibialis (shin muscle) could be beneficial. Physical therapy is crucial when a child has had surgery to help correct spasticity; it helps the child obtain maximum benefit from surgery such as selective dorsal rhizotomy (SDR). There are many other treatments and therapies for cerebral palsy. Speech and occupational therapy are very important. Children with ataxic cerebral palsy need intense occupational therapy to help them use their hands for everyday activities. In order to help prevent cerebral palsy, it is crucial for the medical team to promptly diagnose hypoxic ischemic encephalopathy so that treatment can be started right away. This treatment, called hypothermia (brain cooling) treatment, must be initiated within 6 hours of the oxygen-depriving insult that caused the HIE, which usually means it has to be started within 6 hours of the baby’s delivery. Research shows that hypothermia treatment stops almost every injurious process associated with HIE and can help prevent cerebral palsy. Prevention of seizures is also important in the prevention of brain damage. Seizures cause or worsen brain damage. Thus, if a baby starts to have seizures, she should be diagnosed as quickly as possible so that treatment can begin. Every effort must be made to find the appropriate treatment so that seizure activity can be stopped. If your child has seizures, hypoxic ischemic encephalopathy (HIE) and/or cerebral palsy, contact the award winning birth injury lawyers at Reiter & Walsh ABC Law Centers. Reiter & Walsh is a national birth injury law firm that has been helping children for decades. 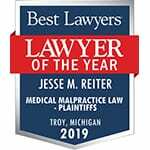 Birth injury attorney Jesse Reiter, co-founder of the firm, has been focusing solely on birth injury cases for over 28 years, and most of his cases involve hypoxic ischemic encephalopathy (HIE) and cerebral palsy. Jesse is currently recognized as one of the best medical malpractice attorneys in America by U.S. News and World Report 2014, which also recognized ABC Law Centers as one of the best medical malpractice law firms in the nation. The lawyers at ABC Law Centers have won numerous awards for their advocacy of children and are members of the Birth Trauma Litigation Group (BTLG) and the Michigan Association for Justice (MAJ). If your child was diagnosed with a permanent disability, such as cerebral palsy, a seizure disorder, hypoxic ischemic encephalopathy (HIE) or periventricular leukomalacia (PVL), the award winning lawyers at ABC Law Centers can help. We have helped children throughout the country obtain compensation for lifelong treatment, therapy and a secure future, and we give personal attention to each child and family we represent. Our nationally recognized firm has numerous multi-million dollar verdicts and settlements that attest to our success and no fees are ever paid to our firm until we win your case. Email or call Reiter & Walsh ABC Law Centers at 888-419-2229 for a free case evaluation. Our award winning lawyers are available 24/7 to speak with you.